3 posts in one day...can you believe it? In all fairness WMW's post was pre written and the giveaway one took 3 seconds, so this is the REAL post for today! So yesterday Kev and I both had the day off. I committed to a whole day without the computer so we could really soak up as much time together and with Jack as possible. I envisioned us relaxing, taking a walk outside-maybe to the park. And then, after his afternoon nap, we would put Jack in his highchair and he would watch as we carved our first pumpkin together as a family. See it would have been a lovely day, except none of that actually happened. 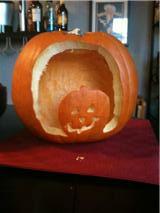 Then we went downstairs to carve the pumpkin. Except Kev decided at that moment he was going to fix the pipe under the sink that's been broken for a week and a half- in his defense I get it.... Only one person can really carve a pumpkin at a time. It's not like it's exactly a two man job. And I have been hounding him to fix that pipe. But then Jack was less than enthralled by my pumpkin carving skills and wanted no part of it so I was frustrated because so far none of this was going to plan. So I took a break from pumpkin carving and brought Jack downstairs to play while Kev finished fixing the sink. Soon it was dinner time for Jack so we went upstairs to eat only to find out that Kev was done with the pipe long ago and had now moved on to installing the safety latches on the drawers in the kitchen. GRRRR. Again, I know it needed to be done, but REALLY? In the middle of my Family Pumpkin Carving Adventure?? On the upside I got Jack and Kevin laughing pretty hard at me! sounds like our weekends, I have big plans and sometimes it goes well! the pumpkin is still cute, put a light in it, turns the lights out and it will look awesome!! You plan, God laughs! I have had to come to terms with that quote long ago! I would've thrown the pumpkin out to the dogs, kudos to you for finishing it!! I have so been there!